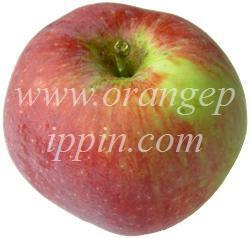 In North America deep red apples have always been popular, and Empire is a typical example of this style of apple. The colour is an intense marroon-red, overlying a light green background, and for children in particular it shouts out "eat me". Empire was developed at Cornell University in New York state, USA in the 1940s, and its parents are classic old North American varieties - Delicious and McIntosh. These are both shiny red apples. It is an ideal lunch-box apple, not least because it does not bruise easily. Empire is a sweet apple with a crisp texture and bright white flesh. Although Empire can be stored for a short period, it is best when eaten straight from the tree. It has the characteristic and unusual McIntosh flavor, often described in apple textbooks as "vinous". Perhaps the best way to describe it is like a hint of melon or pineapple or elderflower. Red Delicious dominates American apple production, but most of that production takes place in Washington State on the west coast. The natural home of Empire is the north-eastern United States - where McIntosh and its offspring such as Cortland are also most at home. Empire accounts for about 60% of the apple exports of New York State, but nationally accounts for only about 2% of American apple production - along with Idared and Jonathan. That still puts it in the top 10 American apples though, but also shows how localised the production is. 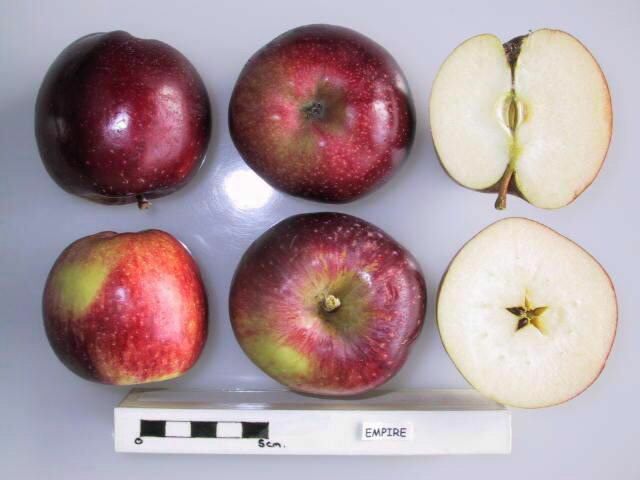 Empire has all the qualities growers look for, easy maintenance, strong well-shaped trees, attractive apples, and heavy crops - no biennial bearing here! Better by far than either of its parents: McIntosh x R. Delicious. This produces well in the dry heat of eastern Washington, and also makes a superior cider base. I've loved the sweet and sour crisp taste of the Empire for years. I moved to California after college and missed the NY apples. Then one day I stumbled onto the Empire at a farmers market. I was hooked and my dad reminded me that it was from NY. Of course! Since they were hard to find in stores and markets I found a tree to plant and it thrives in the CA Bay Area valley summer heat. The sizes vary and my kids like the smaller ones. I share with my neighbors and they also find it's sweet, sour crisp flavors a welcomed change from the normal market brands. Although mostly outclassed by many modern varieties today, The Empire variety Still has a unique flavor that makes it distinguishable to me from all other varieties I have had when it is in perfect form. It can get mealy though and is far from perfect. Exactly what you would expect from Red Delicious x MacIntosh; extremely crisp with a juicy-sweet vinous flavour. Empire has no flavour intensity or complexity whatsoever. It saddens me to think that this is some people's favourite apple. Very dark red skin and somewhat squat appearance makes this apple look almost like an oversized plum more than an apple. Many of the reviews say they don't bruise easily, but I had a hard time finding one in the store that wasn't bruised. They do sound hollow to the touch and when cutting into them. The aroma, texture (mealy), and thick skin is very similar to Red Delicious, which for me is a turn off. However, its flavor is more complex and interesting, if not a touch tart, than a red delicious, and is slow to brown, giving it some redeeming qualities. Not enough to secure a spot amongst my favorites though. I love Empire apples but unable to find any shops that sell them anymore.why?. Empires are one of my favourite varities because they taste quite a bit like a Mac when eaten fresh, but bake better than a Mac (producing better texture). If you want an apple that can play both roles, the Empire is a good choice. Nothing else compares! I, too, am addicted to the crunchy, sweet taste. When I mange to find them in season, no one else in the house is allowed to eat my stash. I didn't realise there were others out there like me who had the 'Empire Addiction'. I can't find anything else that compares. Dont ask me how I made it to 25 year old, living in apple country in NEW YORK where Empires originated, without trying them. I suppose I had overlooked them before thinking they were past their prime; on the tree they look dull and are a very dark almost burgundy/purple color. I went apple picking with my husband 6 years ago and I got curious and picked one, once I shined it up a little it was a beautiful deep red. Once I took a bite I was hooked and I packed the rest of our bags with them. They are a great balance of sweet and tart and they are very crisp. I find eating them warm better than chilled. I havent found the ones in the store to measure up, they arent as flavorful and tend to be more mealy and soft which I dont like in an apple. I am considering getting us our own tree, these are definitely one of my top 5 favorite varieties. By far my favorite apple. I have 2 trees that are consistent bearers. They are great keepers and will remain fresh in my garage refrigerator through winter until spring. They are a bit suceptible to apple scab, but will do well if you plant them where there is good wind circulation, sunlight and you maintain a regular spraying program. I just bought a house and discovered two small Empire apple trees in the back yard. They are heavy with fruit and much to my delight when I bit into the first one I picked. Juicy, sweet and crunchy, excellent flavour ! A great addition to my early season Duchess. I am elated to have these trees. Bo- This apple is soft all over. A sweet red flavor and a flesh soft and mealy enough for children's fresh teeth. Mash 'em yourself for home-made baby-food! By far my favorite, sweet-tart and crunchy. an all around good apple...I just wish the Western varieties of apples were even remotely as good a NY apples. I have lived in the West for 6 years and I still have not way to get my NY apple fix, specifically my EMPIRE apple fix. The apples in UT are mostly from WA state and for the most part are flavorless (even the apples from local UT orchards are bland...why bother??). I tried the empire apple while in the orchard at UCSC where there are 100 different apple tree varieties. Its taste was distinctively gratifying, crunchy, and a good balance of sugars and acids. I am ordering four for my own orchard. A beautiful, crisp, juicy, sour-sweet apple with firm flesh that stores very well. Examples grown in New York state are the best. Ones from British Columbia are inferior in both taste and appearance, but still very good apples. Empires are our favourite apple and we can't usually find them here on the Island. We came from Ontario where they were easier to get. Now I'm looking for tree stock so I can grow my own. I love Empire apples so much that I have to eat at least 2 a day to be happy! It's February and they're really sweet and crispy and juicy right now. I get them at Morrisons and was looking online to find if they are anywhere else, cheaper. An apple that fits into the palm of my hand costs about 40p, which is more than half a dollar. Crazy! I am concluding that this apple may not do so well in the UK in a less than good summer. I like the acidity, juiciness and the crunch, but the sweetness that many US posters mention is very often missing. It would be best described as watery. I will reserve judgement until I have tasted one from the UK from a great summer. Empires are grown mainly in the US and Canada but there are some grown in the UK and Benelux. The only problem is that they are available from Late October to April / May (depending on the season). While I love the taste and the crunch of this apple, I do not like the skin for some reason. I have to agree with every positive review of the Empire variety. We are fortunate to have a backyard supply. The tree was here when we moved in 25 yrs ago and until now we did not have a name for it--just called it "sort of like a Spartan" :-) Thanks to a friend who referred me to your great website, we now have the name for this queen of apples. Thank you! I tried this variety for the first time last year while looking for a good drying apple. Of 10 varieties that I dried, Empire retained it's flavor best, with a pleasant texture. I will be drying more this year, you can be sure! Empire are without doubt the best apples I have ever eaten, but are only available for a short time here in the UK (Tesco is the only place I can find them!) BUT, does anyone have any suggestions for alternatives which come a close second when Empire are not available? yes a superb apple. Waitrose and Sainsbury's often sell them where I live. I used to buy apples every week, usually buying on price and looks. I first tasted Empire Apples last year when I bought some from Tesco, they were by far the best apples I have ever eaten. After a few weeks our local Tesco seemed to stop stocking them so I stopped buying apples because no other apple compares. Fortunately Tesco have now (March 2009) started stocking them again so they are back on the weekly shopping list. empire apples are sold in borehamwood tesco, in hertfordshire. they surely are one of the best apples there are. Saw these for the first time at Sainsburys. They might be stocking them soon. I would like to add "The empire apples are friendly if you suffering some sort of alergy, myself Empire apples are the only apples i can eat without alergy reaction. again does anybody knows why they are not in the UK market???? i dont know what to do, the supermarkets no longer sell these amazing apples, i formed a habit of 4-6 a day! i am at a loss and no other apple measures up :( hence me going to great lengths to find them, sigh. where is this u-pick empire apples in julian? what is it called? thanks! I just visited Julian, CA where there is a U-Pick apple orchard with Empire apples. The Empires were the best of the varieties they had. On the branch in the sun, they actually look more purple, but once you rub off the natural dust, they were as pictured. Very sweet, crunchy, and easy to eat more than one. In the orchard at ambient temperature, you don't really notice the tartness, but once refrigerated and cold, the tartness comes out. We love Empire apples and cannot get enough of them (literary) none of the supermarkets are selling them at present. As a child, I grew up in a part of the country where apple orchards were plentiful, and many varieties were readily available. However, it has been only recently that I have gotten hooked on empire apples. Their firm, crisp texture and pleasantly sweet flavour make them a satisfying snack...everytime! I was always an avid Granny Smith eater, the sharper the better, but my tastebuds have now changed and I am hooked on Empire Apples which are beautifully crisp and sweet, unfortunately I have been unable to buy any these past two weeks in any of my local large supermarkets, I must ask and find out why!! The empire apple is a tasteless, hard apple whose parts add up to far more than the sum. McIntosh and Red delicious are among the fruitiest, juiciest apples apples around, and it is annoying that the hybrid is so poor. I bought some Empire apples for the first time about 3 weeks ago and have bought them evey time I have been shopping since. They are delicious, crisp (they give that appealing crunch sound everytime you bite a wedge off) and juicy. I'd day they are definitely my favourite apple but then I am a relative newcomer. I have only recently started buying different varieties in order to compare them but I am now hooked, thanks mainly to this site. People at work think I'm a bit mad but I managed to ween one person off her Red Delicious the other day with the help of the far superior Empire! Empires are the best apples ever! They're so crisp and sweet..I'm addicted I eat 3/4 a day. My favorite out-of-hand apple, having supplanted the Macintosh. Sadly, only available here in the fall. Empire, in my opinion, is far and away the best apple for fresh eating. It used to be in good supply in grocery stores in North Carolina when I lived there, but disappeared three or four years ago. Now, here in Colorado, the produce managers that I have queried have never even heard of it! They are in the supermarkets at the moment. Tesco is best. but they frequently sell out cos they are so popular. I LOVE Empire apples but am having a hard time finding them in the eastern part of VA. Do you know any reasons why? I used to be able to find them here.